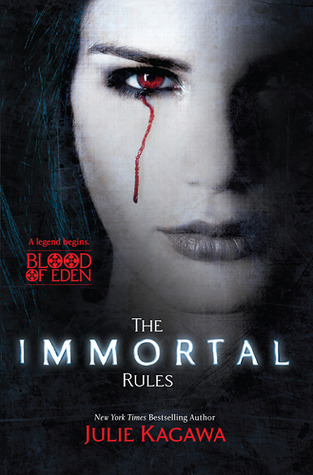 I have wanted to read Julie Kagawa books for a while and jumped at the chance when I saw “The Immortal Rules” on Netgalley. I have all of the Iron Fey books on my Kindle…but other books have taken precedence, but I plan on reading them this year. I’m glad I put other books on hold to read “The Immortal Rules” so I can find out what kind of writing style Julie Kagawa has. At the end of the book, Julie Kagawa said that she never thought of jumping on the “Vampire” wagon. I’m glad she did though. =) I love reading books that Vampires are not the mushy, romantic, and sparkly kind…instead they are feared, hated, killing monsters that we are used to reading them as. Julie creates a world where the Vampires run the Humans. Humans are either registered (give blood – they are given food, etc.) or they are unregistered (fend for themselves for food, etc.). Vampires live in the “Inner City,” and humans live in the “Fringe.” City Walls protect the fringe from the outside world which harbors rabid (which are soulless creatures just like Vampires but even Vampires fear them because they’re an abomination of the Vampires). It’s a crazy world where no one is safe from dying. I like how Julie just automatically puts the characters into danger and of course, if you’re close to certain characters already…just let’s say you won’t be after a few chapters. The main character, Allie is the focus of the book, and I adored her character. She is strong, determined, and fights back (emotionally and physically. She defies pretty much everything as human and a vampire. I won’t get into the description of the book because I don’t want to spoil it for anyone who is thinking about reading this book. Let’s say be prepared for anything to happen. Reminder…do not get too attached to characters. Also, don’t expect happy beginnings or endings for Allie. Allie was put through a lot in this book, and I definitely will be reading the next installment. I did find that the book dragged in some parts and Julie did spend too much time in certain areas of the book, but in the end, I loved this book.